BJJ is also known as Gracie jiu-jitsu, in honor of the Gracie family. 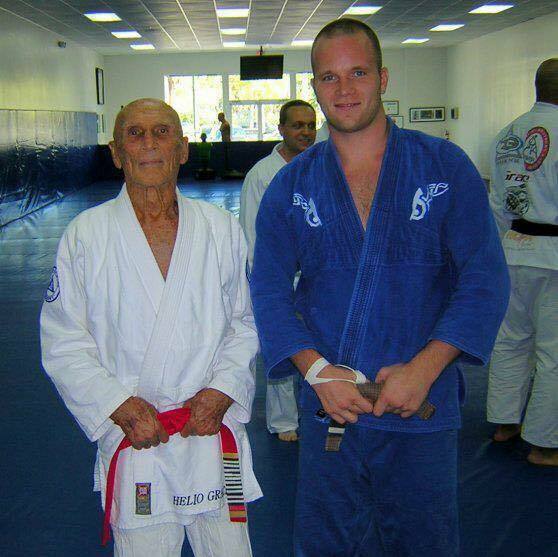 Helio Gracie (1913-2009), the founder of the style as we know it today, just recently passed away, so most of the events in the development of the art are well documented. Thus, the history of Gracie jiu-jitsu, much like the application of the art itself, does not depend on vague traditions or unfounded legends. In the early part of the 20th century, Helio’s brother Carlos Gracie studied Japanese jujutsu under the great champion Mitsuyo Maeda (known in Brazil as Conde Koma, or the “Count of Combat”). The system that Maeda taught was a modified version of pre-World War II jujutsu, with a heavy focus on ne-waza (ground technique). Carlos Gracie taught these techniques to his younger brothers and to his older sons, and they, in turn, taught their brothers, sons, nephews, and cousins. The Gracies began to open academies to teach others, and jiu-jitsu soon became the family business. Carlos knew that the system his family was developing could surpass any contemporary martial art in realistic combat. To prove this to the rest of the world, he issued the “Gracie Challenge.” This was an open invitation to fight anytime, anywhere, regardless of style or size. The tradition of the open challenge has been continued by his family and students, who have consistently demonstrated the superiority of Gracie Jiu-Jitsu throughout the world. As a young man, Helio was the smallest of the Gracie brothers, and also the most sickly. He was prone to fainting spells, and due to these health issues, Helio was not allowed to train jiu-jitsu. Instead, he spent much of his time watching and studying the techniques that his brothers taught in class. At the age of 17, Helio was called on to teach when Carlos, the instructor at the time, was not available for one of his student’s lessons. Carlos arrived later offering his apologies, but the student assured him it was no problem and requested that he be allowed to continue training withHelio. Carlos agreed, and Helio became an instructor. Of course, much of the popularity of Gracie jiu-jitsu in the U.S. today is due to the success of Helio’s son, Royce Gracie, in the early UFC events. For more information on Royce, click here.